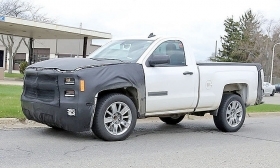 Recent spy photos signal that General Motors is freshening its Chevrolet Silverado and GMC Sierra full-size, light-duty pickups, which have been panned for bland exterior styling. The photos show a larger front grille, lower air dam and revised headlights on both of the trucks. A few photos appear to show the addition of LED daytime running lights on the Silverado, which now does not offer them even on top trim levels. Both trucks' hoods also seem to get updates, with down-sloping appearances in the front. 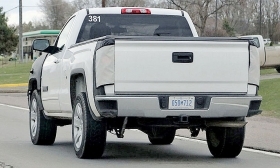 The spy photos also show revised taillights on both trucks. The freshening likely would come in 2016 as 2017 models. GM plans to launch redesigned pickups in 2018 as 2019 models.